Home > Raptis Rare Books > Tales of the Jazz Age. New York: Charles Scribner's Sons, 1922. First edition of Fitzgerald's iconic collection, with eleven stories including "The Curious Case of Benjamin Button," basis for the award-winning 2008 film. Near fine in the original very good dust jacket with some unnecessary tape repair. Dust jacket illustration by John Held. One of 8,000 copies with "and" on p. 232, on line 6. Bruccoli A9.I.a. Bruccoli & Clark I:132. Smiley, 46. First editions in the original dust jacket are rare. 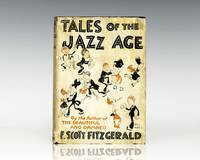 Tales of the Jazz Age is a collection of eleven short stories by F. Scott Fitzgerald. Divided into three separate parts, according to subject matter, it includes one of his better-known short stories, "The Curious Case of Benjamin Button". All of the stories had been published earlier, independently, in either Metropolitan Magazine, Saturday Evening Post, Smart Set, Collier's, Chicago Sunday Tribune, or Vanity Fair. The Curious Case of Benjamin Button was adapted into the film bearing the same name in 2008, directed by David Fincher and starring Brad Pitt and Cate Blanchett. The film won three Academy Awards including Best Achievements in Art Direction, Makeup, and Visual Effects. Title: Tales of the Jazz Age.